Easter means a lot of things to different people, and not just in the religious context. It is a holiday when you gather with family and friends to enjoy a big meal. The foods served for this celebration can be as varied as the types of people who prepare them. Folks in New England might prepare ham with pineapple, some form of asparagus, scalloped potatoes and dinner rolls. A midwestern Easter meal might consist of lamb, potato salad with peas and ham, glazed carrots, and hot cross buns. Southwestern families might have stuffed rabbit, Easter egg bread, roast pig, fresh farm veggies and deviled eggs. Southerners, on the other hand, pull out all the stops for all food-centered holidays, and Easter is no exception. Menus differ from family to family, but some components are consistent. Meats can range from ham, roast duck or goose, turkey, lamb chops and even pork loin. There are always veggies, and potatoes of some sort. As for dessert, coconut seems to be the reigning favorite. If ham is your chosen meat, you’ve got two possibilities. Buying a whole one with bone-in, or a spiral-sliced boneless one. If going with the bone-in option, line a roasting pan with foil and place halved onions and whole carrots across the bottom. Sprinkle with salt and pepper, then place the ham on top of the veggies. Pour 16 ounces of ginger ale or orange soda, across the ham, and bake covered for about six hours at 325 degrees. Baste periodically. Finish the last 30 minutes uncovered. Spiral-sliced hams are pre-cooked, so it’s important to ensure they stay moist while reheating in the oven. The benefit of a spiral-sliced ham is that a glaze can melt onto the pieces themselves. Place ham in a roasting pan, and tuck three halved oranges around it, removing the seeds first. Add two quartered apples. In a medium bowl, whisk together ½ cup molasses with 2 teaspoons Dijon mustard (or more to taste) and 2 tablespoons apple cider vinegar. Spread the glaze generously over the ham, cover and bake 2½ – 3 hours at 325 degrees. Periodically spread more glaze over the ham while cooking. Remove cover 30 minutes before done to crisp the glaze. I you don’t like molasses, you can substitute ½ cup brown sugar and 2 tablespoons melted butter instead. Sides are just as important to the Easter meal as the meat. 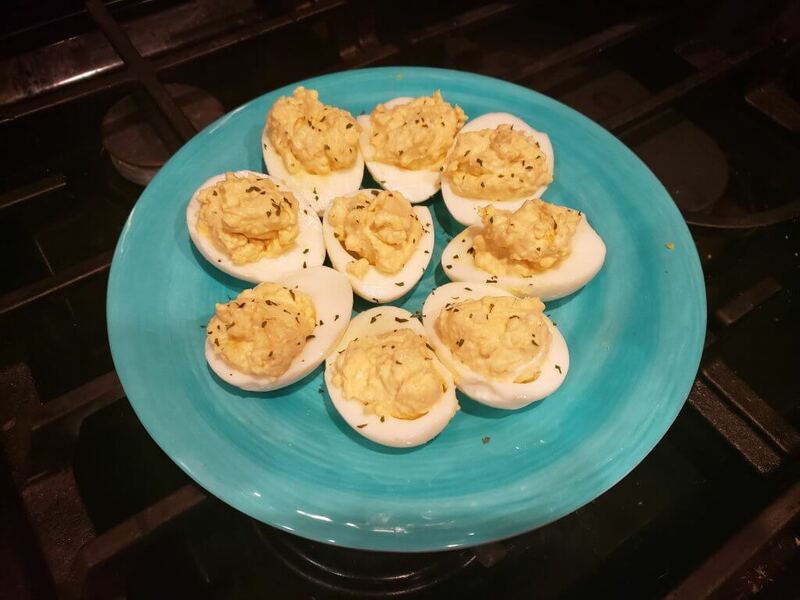 One of the most popular is deviled eggs and the filling can be as different as your taste buds. Think of adding additional ingredients, such as bacon, crab meat, horseradish, sriracha, feta cheese, or even fresh parmesan cheese. Other sides might include sweet potato casserole, potato salad, pasta salad, scalloped potatoes, hashbrown casserole and macaroni and cheese; all are staples of a Southern Easter meal. Vegetables play a big part in the meal as well. Carrots in one version or another always make an appearance. Whether they’re roasted, raw with dip, in a casserole or cake, no Easter meal is complete without them. Green beans are a must-have, but not necessarily the green bean casserole you had growing up. Try laying fresh green beans on a baking sheet drizzled with olive oil, sprinkle garlic salt and a dash of red pepper over them, then bake approximately 15-20 minutes at 400 degrees, until the beans appear to wilt slightly. Remove from oven and toss with balsamic vinegar or minced garlic, additional salt and fresh parsley. To amp up the savory factor, you can also toss in some crumbled feta cheese. Fresh asparagus can also be prepared the same way, just make sure to trim the tough ends before baking. Brussel sprouts are another favorite of Southern tables for Easter. To prep them, simply cut off the end and peel the outer layers to reveal the more green leaves underneath. This needs to be done no matter how you plan to prepare them. To make a quick salad, thinly slice the Brussel sprouts, then toss in a large bowl with finely chopped Vidalia onion, shredded carrots and sliced almonds. In a separate small bowl, mix together 2 tablespoons extra virgin olive oil with 1 tablespoon apple cider vinegar, 1 tablespoon granulated sugar, 2 teaspoons salt, and a dash of ground red pepper. Toss with Brussel sprouts and refrigerate at least two hours before serving to allow flavors to meld. If you prefer cooked Brussel sprouts, simply slice in half, and lay face down on a baking sheet. Sprinkle ½ cup chopped pecans amongst the sprouts, then drizzle with extra virgin olive oil and salt. Bake at 400 degrees for 30 minutes, or until sprouts begin to turn golden. Remove from oven and toss with a little honey and either lemon juice or apple cider vinegar just before serving. No Easter meal is complete without dessert. 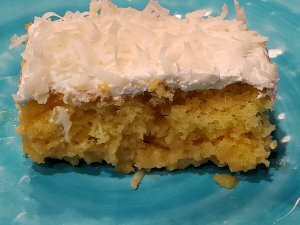 Whether it’s carrot cake, various forms of cake with buttercream frosting, or creamy coconut cake, the dessert choice for this holiday always seems to be cake. Coconut is a popular flavor to use in Easter cakes. Not a baker? Not to worry – simply buy a pound cake or angel food cake, slice and bake for 15-20 minutes, then top with coconut ice cream and hot fudge sauce. Strawberry or raspberry jam are delicious if spread on the cake before adding the ice cream and hot fudge sauce. No matter what your meal plans are for Easter, just remember where the recipes came from that you make. Mim’s biscuits? Check. Slow cooker macaroni and cheese? Check. Grandma’s carrot casserole? Absolutely. Your version of baked ham? You betcha. No matter what you serve, celebrate the ones you’re with and the recipes of those who are no longer with you, but still very present through their food. Happy cooking everyone! – Tiffany Hughes is an Acworth resident and is volunteer coordinator/scheduler for the Booth Western Art Museum. Preheat oven to 425 degrees. Add flour to a food processor, then shred ½ stick cold butter into the flour. Process flour and butter together until crumbly. Pour in buttermilk and pulse only until flour is moistened. Place 2 tablespoons butter in a cast iron skillet and place in the oven to melt. Flour a large surface and place dough on it. Dust hands with flour, then knead dough three or four times. Next, coat a rolling pin with flour, and roll dough out to 1 inch thickness. Cut with a biscuit cutter. Remove skillet from the oven, and place biscuits in the pan, making sure to flip them once to coat both sides with butter. Make sure biscuits are touching to ensure they will rise while baking. 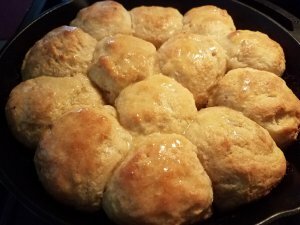 Place skillet in oven and cook biscuits approximately 12 minutes, until golden. While biscuits bake, melt the remaining 2 tablespoons of butter. Remove from oven and immediately drizzle with butter. Combine all ingredients, except ½ cup cheddar, in a slow cooker that has been sprayed with cooking spray. Stir to mix in seasonings, then cook on medium for 2 ½ – 3 hours, until pasta is done. When it is tender, sprinkle the last ½ cup cheddar across the top and let set until melted. NOTE: Diced jalapenos can be added for a spicy version. Prepare cake mix according to package directions. While the cake is baking, in a small mixing bowl, whisk together the sweetened condensed milk with the crème of coconut. When cake is removed from oven, poke holes across the top using the handle of a wooden spoon. Immediately sprinkle a handful of coconut across the top, then pour the condensed milk mixture over it. Let cake cool, then cover the top with whipped topping and coconut. Refrigerate for at least 30 minutes before serving. Cook carrots in boiling water, then drain. Put in large bowl with remaining ingredients, except the stuffing mix. Pour in an 8×8 casserole dish that’s been coated with cooking spray. Top with stuffing mix, and bake for 20 minutes at 350°. Place eggs in the bottom of a pot, and cover with water. Cook over high heat just until water boils, then cover, and remove from heat. Let sit for 20 minutes. Next, drain water and immediately run cold water over the eggs. Peel as soon as they are cool enough to handle, starting by cracking the egg all over and peeling from the narrow end first. Slice eggs in half and lay on plate. Remove yolks and place in bowl. Mash, then add remaining ingredients, making sure to taste. Sprinkle egg whites with salt, then add a heaping teaspoon of yolk mixture to each. NOTE: Extra eggs can be boiled, but do not need to be filled until the day you plan to eat them. Simply store the whites in a zip top bag and the yolk mixture in a container with a lid in the fridge.